This week is our final celebration of Happy Blogoversary Month. I mulled over how I could make this drawing extra special. Since all of you expressed interest in Julie Lessman's books, what better giveaway than all 3 of her titles? Yes folks, we're going to have not 1, not 2, but 3 happy winners in this contest. A simple comment and your email address in the usual format (susanjreinhardt (at) _____ (dot) com) will secure you a place in this great giveaway. The contest is open to those in the Continental U.S. and Canada. It starts Monday, May 25, 2009, and runs through Saturday, May 30, 2009. The winners will be drawn on Sunday, May 31, 2009. Don't miss the opportunity to win one of Julie's books. Quick, get your fingers on that keyboard and enter the drawing! Wow, how cool is that! Your blog is wonderful! Happy Blogoversary! Thanks for having such fun contests this past month, Susan! What will we do when the celebration is over?! I think we should think of something else and keep on partying! I already own the first two so can I just be entered for the third? Thanks for the contest! I hope you have a wonderful Memorial day. Oooo..Im the first commenter! A round of coffee and doughnuts for everyone! You're the first entry. I don't know if that will give you an advantage, but with 3 books up for grabs, you're chances are pretty good. Thanks for entering. Maybe this time your name will be drawn from the bag. If your name is picked, remind me of your preference. I'll do my best to accommodate everyone's choice, but I only have one of each book. Thank you for the nice compliment. I hope you'll visit often. I post here Monday, Wednesday, and Friday. Did you want to enter the contest? Please leave another comment with your email address so I can reach you. Don't be embarrassed. Join in the fun! Thanks for the glowing testimonial about Julie's book. I'm sure she'll be thrilled. What a cool contest! I already got to win something fun from you, but I've heard these books are great! Thanks for hosting this! LAURALEE ... I TOTALLY agree -- Susan's blog IS wonderful, as so is Susan! I'm incredibly blessed we connected!! JODY ... and I echo your praise of Susan's Blogoversary month -- I've had a blast here, and I know everyone else has too! And I'm with you ... what's next??? JESSICA ... your chances are real good to win the third book in the series, my friend, especially if you check out my website calendar, where I list TONS of opportunities to win free signed books! Thanks for stopping by. KAREN, thanks for entering the contest, and good luck! And, SUSAN, thanks AGAIN for your amazing hospitality and friendship -- I am blessed to know you! Hmmmmm...I would love to get a copy of A Passion Most Pure! I've read it but I think someone I let borrow the book decided to keep it! So I'd love the opportunity to get a copy to complete the series! Hey, susan. I thought I had already entered, but apparently it didn't go thru, so hope this isn't too late. I have the first two books, so please just put me in the drawing for the third one! Thanks! I'm so happy that your giving away the books again. I already owe the 2nd and 3rd of the series and would love to own a copy of the first book. If it's possible to be entered in the drawing for the first book that would be wonderful. CINDY ... soooo glad you heard these books are great, now we just have to convince you by getting one into your hands, eh? Thanks for entering the contest and good luck! Thanks so much for the chance to win Julie's books! I enjoy them so much! Renee, Carolyn - Thanks for entering the drawing. I've just found your blog and love reading the various posts. Welcome to my blog! Thanks for your kind words. I post here Monday, Wednesday, and Friday. You're entered in the drawing. Watch for an announcement Sunday. I'll also email the winners provided the left an address. Nice to see you again. Everyone's name is going into one bag, and 3 winners will be drawn. I'll do my best to give everyone their preference, but I can't guarantee it. Hope you enjoyed your trip. Many people have requested a specific book. Perhaps I should split up the entries by book. I'll give it some thought. This might be a problem because not everyone expressed a preference. Thank you for sharing this opportunity, Susan. I would love to win any of Julie's books! ROSE, thanks for stopping by and entering the contest -- good luck! PEACHYKATH ... I trust you already received your copy of A Passion Redeemed with the Boston Baked Beans?? Let's see if we can't rack up another signed book for you, okay? AMBER ... can't wait to hear what you think of Charity in book 2! Let me know, okay? CAROLYNN ... you sure deserve a free book, my friend -- thanks for all your support! CANDEE ... Thanks so much for taking the time to comment and enter the contest -- good luck! Thanks for entering the contest. I hope you'll tell your friends about it. I hope you're taking your name out because you won the books somewhere else! Please take my name out of the contest...I won a copy elsewhere yesterday and I want someone else to get a chance to read these wonderful books! I'd like to enter! These books are great! I've read the first two, but I actually never bought them because I came across them at our local library. I get my books from Walmart usually(small town), and I haven't seen any of Julie's there. I'd especially love to win A PASSION DENIED since I have yet to read it. *My word verification was "GASPha"! I guess everyone can gasp because I don't actually own one of the three. LOL! Thank you, generous lady! Please enter moi. Please enter me in the drawing. I'm excited about reading the series. The excerpts that I've read peaked my interest. 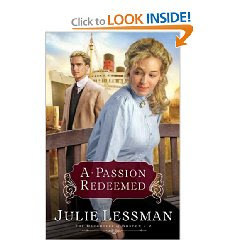 Also, I just got my copy of A Passion Redeemed today! I was so excited! I started reading the first few pages, and I'm glad to see it picks up right where A Passion Most Pure left off! Thanks Julie, for my new book! CONNIE, oh, girl, we are going to have to get these books in your hands!! This is a good way to do that, so good luck! RENEE and SHERRINDA ... You two are SO lucky ... or I should say SO diligent at leaving comments! I'm thrilled you both won and I think it's nice of you to turn a book back in since you each won more than one -- bless you! COURTNEY ... gosh, I WISH I was in Walmart (I was for a while, but just in one or two stores), but I have no problem with you getting my books at the library as long as you talk them up!! :) And if you can win one here (or from one of the other blog giveaways on my website calendar), so much the better! Good luck! JEANETTE ... Thanks for entering the contest, and I wish you the best of luck! I left a comment yesterday, but I don't see it here. Please enter me in the drawing. I am so interested in reading Julie's "edgy" inspirational stories. Many thanks to Renee for introducing me to blogging ~ it seems like fun! I would love to be entered in the contest for Julie's books. Like Jessica, I already own the first 2 (GREAT books! ), but am looking forward to reading the 3rd. My aunts birthday is coming up at the end of June, so I could always pass along the first 2 to her! She loves to read, too. Thanks for entering. You'll enjoy the 3rd book. Julie keeps the suspense going. Just when you think everything's all settled, she throws in a monkey wrench. CHICKI ... 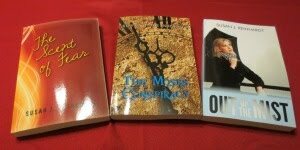 Thanks SO much for your interest in my books and good luck in the contest. If you don't win here, though, be sure to check my website calendar for additional opportunities in blog giveaways, okay? LORI S ... Love your addy, by the way (sugarandgrits!) -- very cute! Thank you SO much for your sweet comment about books 1 and 2 AND for spreading them around. Word of mouth is everything in this business and I so appreciate it. SUSAN, thank you, too, for your invaluable word of mouth (and word of blog!) on my books AND for the GREAT promotion you've given me here. Yes, Julie sure draws a crowd. :) It's well deserved. Her books provided me with many hours of reading pleasure. pretty please enter me for this drawing; many hours of great reading are in store for the winner(s). Thank you for the Happy Blogoversary wishes. I hope you'll stop by often. I post here Monday, Wednesday, and Friday. I'll notify the winners via email and blog announcement on Sunday. Welcome to my blog! Thanks for entering the contest. JAIME ... AND a popular blog!! Susan's blog always keeps me jumping because of all the comments, which, trust me -- I don't mind!! Thanks for entering the contest -- good luck! I love these little details about lilac water, etc. Thanks for stopping by so often to respond to commenters.